Liberty LRP-3553 (mono - cover pictured above). From the back cover: If there ever was a "Si Zentner kind of music," this is it – music of great intensity and drive, just right for Si's big-band style. 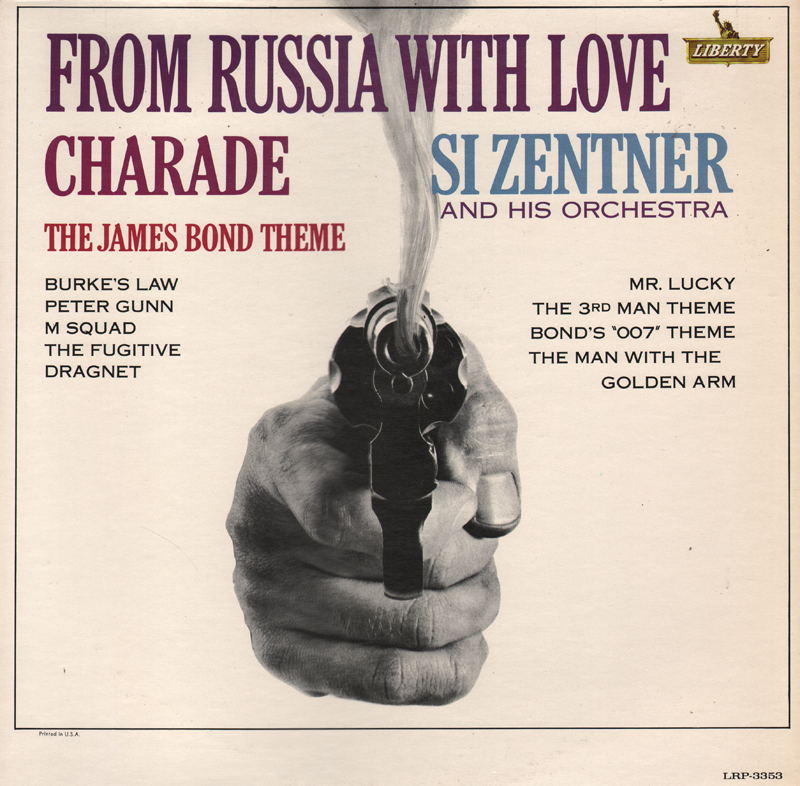 The Bond themes seem to have been made for Si's band, as do the all-time swinging themes like "Peter Gunn" and "Mr. Lucky". 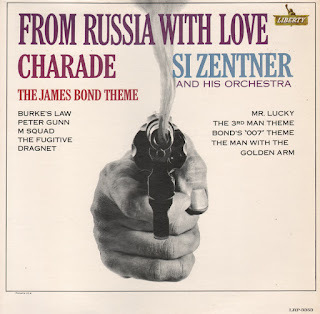 From Billboard - May 23, 1964: The Zentner modern big band is a first-rate vehicle for the equally modern and intense themes for the equally modern of our more popular detective thrillers. Complimenting each other are Si Zentner and themes from "From Russian With Love," "Golden Arm," "Dragnet" and "Mr. Lucky," to mention a few. Jack McDuff – Born and raised in central Illinois – No formal musical training – taught self to read music and play piano while in Navy – toured with various R&B bands 1948 - 54 – formed own jazz group 1954 – broke group up 1957 and quit music shorty after – returned to jazz 1958 as bass player – began playing organ same year and soon joined Willis Jackson's combo when regular organist left – formed own group 1959 and has stayed with the quartet format ever since. Benny Golson – Born and raised in Philadelphia – Studied music at Howard University – toured with several bands during the early 1950s – Joined Dizzy Gillespie's big band in 1956 and played throughout the world – began writing and arranging extensively during this period – wrote I Remember Clifford, Stablemates and Whisper Not, 1957 – Joined Art Blakey as arranger and saxophonist in 1958 – Stayed with him till late 1959 when he formed JAZZTET with Art Farmer – First recording date with group made his tune, Killer Joe, national hit – JAZZTET disbanded in 1962 – Has devoted bulk of time since to writing and arranging. Easy space age instrumentals. 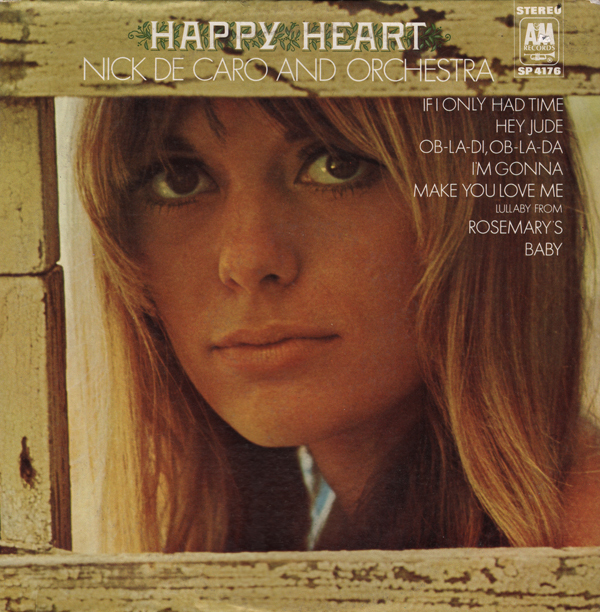 However, there are several tracks on which De Caro sings, including the sweet sample featured above. 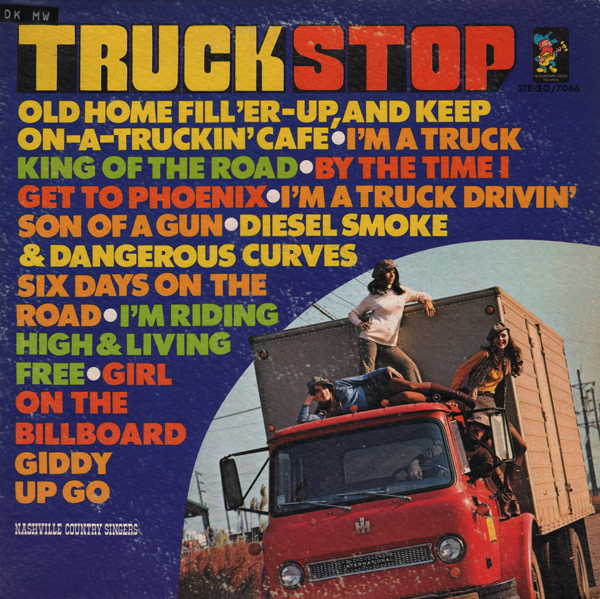 Also see Truck Driving Songs. 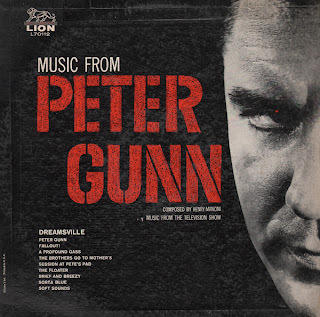 Super jazzy cover of Mancini's Peter Gunn featuring the throbbing bass beat of Aaron Bell. From the back cover: The "most" on a bass, Aaron is known in the jazz field as a dedicated perfectionist. His playing and arranging have always been characterized by good taste and its quality of being able to reach everybody. A veteran of such top American combos as those of Teddy Wilson, Andy Kirk, and Lester Young, he recently appeared on The Embers and The Left Bank in New York City, drawing ratings by fans and musicians as one of the top bass men around today. He also appeared on Broadway in the stage version of "Compulsion". The musicians Aaron chose to appear with him in this album were chosen for their flexibility and inventiveness and are considered to be among America's top musicians. I believe that is Gibbs on the cover. Released several times on Halo, as well as other budget labels featuring different cover art. From the back cover: The intriguing background for Harpo In Hi-Fi is provided by the Freddy Katz Orchestra. Katz, while musical director for the Seventh Army Headquarters in Europe, backed touring artists such as Lena Horne, Vic Damone, Mindy Carson and other luminaries. As a cellist, he worked with the National Symphony, the Acolian String Quartet, and even the Chico Hamilton Progressive Jazz group. Co-featured is Bill Marx, 20 year old son of Harpo, and currently a student at Juilliard. Young Marx arranged and conducted That's All and scored Lullaby Doll and They Say It's Wonderful. His work here predicts a brilliant future. The remainder of the arrangements were artfully written by Katz. This was a fun find. 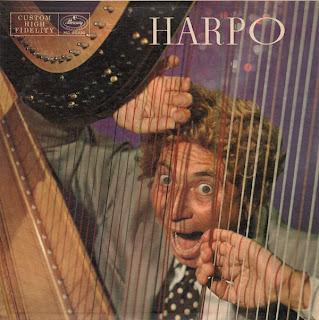 I fondly remember Harpo playing harp in the movies and always kept an eye out hoping to find one of his albums. This recording is far more than just the Harpo you see in the movies making a record. 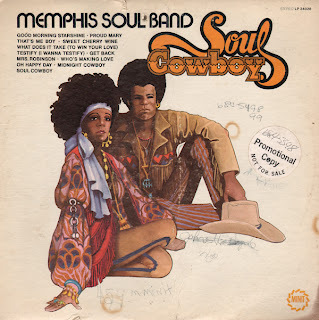 This LP is also one damn fine mood music set that competes with any period record that I've listened to. The arrangements are sophisticated, lush and the engineering captures the deep tones of the bass while accentuating the vibrating quality of the harp. Original issue: Capitol ST 2119. From the back cover: Mort Lindsey was on his way to becoming a professor of music when his education was interrupted by World War II. After three years in the Air Force, he returned to complete his Master's Degree at Columbia University. However, he never got to teach a class because on the day of graduation he accepted a position as staff pianist with the National Broadcasting Company in New Your City. Mort stayed at N.B.C. 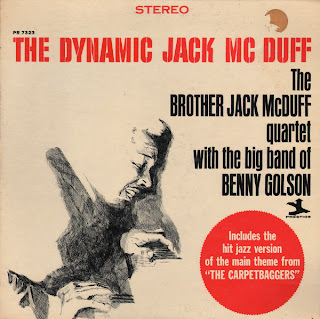 for three years during which time he played an average of twelve fifteen minute programs weekly, working under conductors such as Lyn Murray, Roy Shield, Norman Clotier and Milton Katins and with artists including Morton Downey, Jane Pickens, Paul Winchell, Eddie Albert and many others. He then left to free lance and in a short while was playing the organ for three weekly quiz shows, helmed by John Reed King, Joey Adams and Don Ameche, respectively. In addition he managed to handle the piano chores on Jerry Lester's "Broadway Open House," and a daily TV show headed by Andy and Della Russell. It was at this point in his career that Mort decided he wanted to be more than just a pianist and he promptly gave up his many radio and TV shows, and proceeded to study singing. 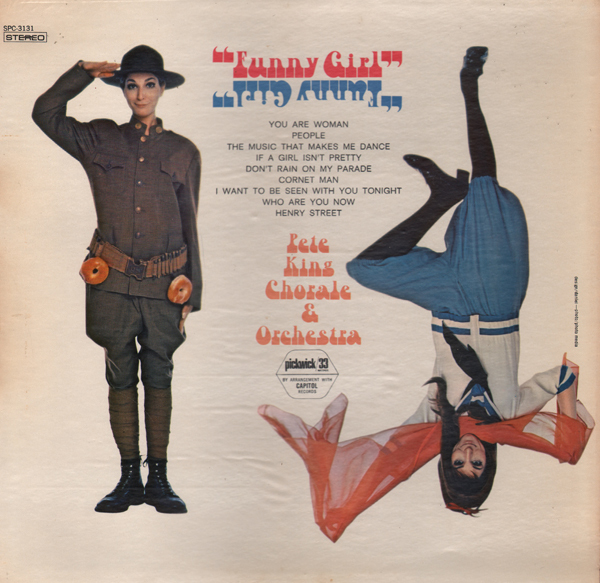 In order to finance his studies and to remain in the background he went to work as an arranger on the Arthur Godfrey program working under Archie Bleyer's direction. 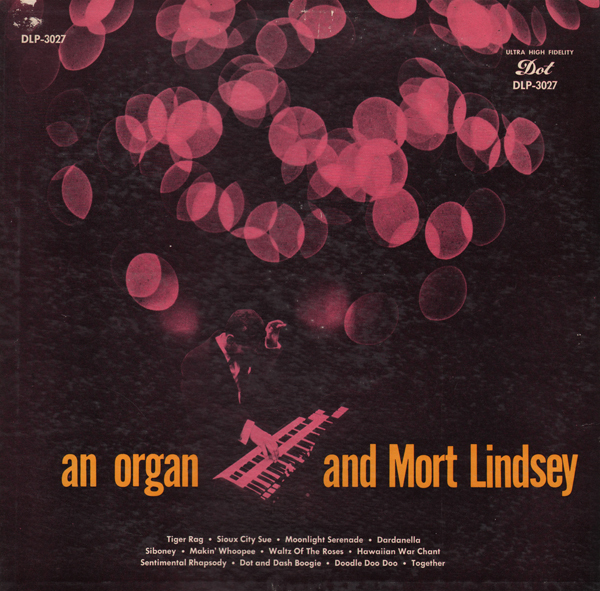 When he felt ready to make the transition from pianist to singer-painist, Mort embarked on the supper club circuit. He made several records and had on of the top novelty records of 1953 - his own composition, entitled "Scratch". It was while he was appearing at the "Ruban Bleu", in New York City, that Mort was offered the position of singer, orchestra leader and musical director of the George Skinner Show, which was heard five times weekly on WCBS-TV. Mort makes his home in Nutley, New Jersey, and is married to Judy Johnson, the lovely television singing star. Splendid! Raim creatively blends mood, space age pop and jazz. His inventive arrangements are guaranteed to keep you engaged. Superior stuff! 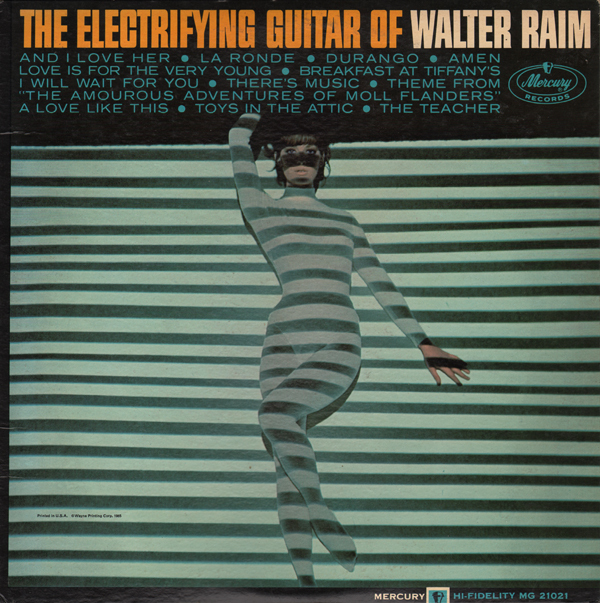 Walter is known widely for his significant, influential work in the folk music field as performer, annotator, arranger and musical director. He served as assistant conductor and first accompanist for the Belafonte Singers for two years. 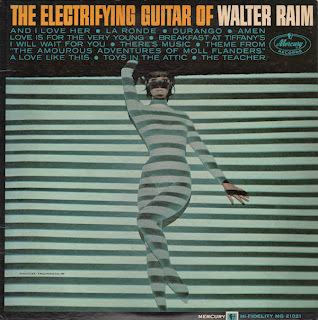 Walter's ever-widening musical horizons have increasingly led him into broader areas of musical expression. He plays electric and classical guitar, celeste, and piano as well. He met Bobby Scott, pianist and Mercury A & R director, when he was working on an album for Bobby Darin on which Bobby Scott played piano. That meeting led to a rewarding friendship between the two inventive musicians. Walter's talents are not limited to the musical field as he is also an expert skier and tennis player. He has traveled extensively throughout Europe, the islands and Canada. Session musicians include: Russ Sakakus - bass, Alvin Rogers - drums, Hank Jones - piano, Don Elliot - vibes and percussion, Phil Kraus - vibes and percussion and Bobby Scott - piano.